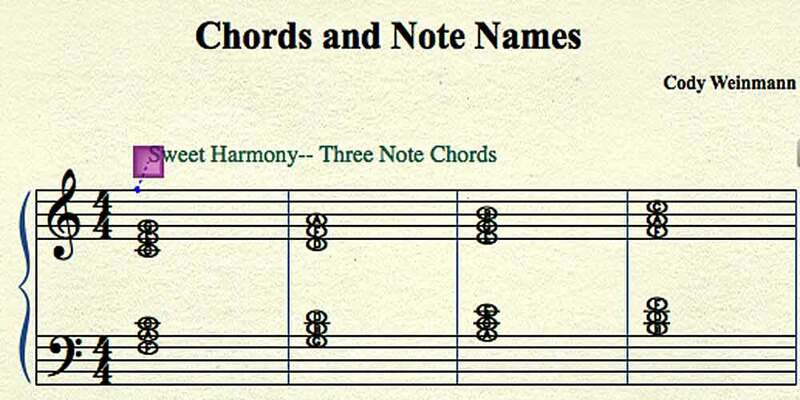 Welcome to the music theory basics page. On this page, I will be disclosing some methods by which you (or your student) can get music theory in a matter of hours not years. First we need to go over some of the basics about not just notation but what the notes on the staff mean. Every note on the staff has a name. Use the diagram below to help you see what the notes are. 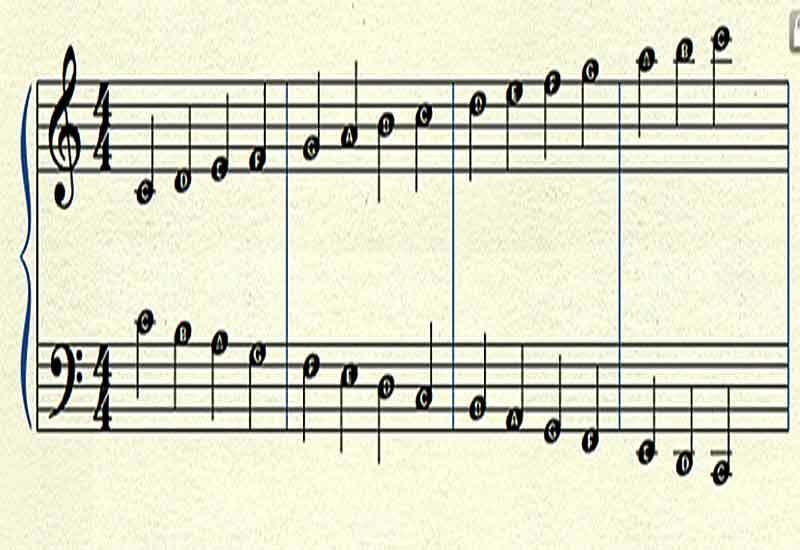 We note here that all the note names go A through G repeated over the span of what are called octaves. We often use acronyms to help students better remember what each of the note names are in each of the two basic clefs. For more on the acronyms, please go to the piano tips page. We also notice that if we play any two notes that are separated with one note between them, we get what is called harmony. This is where the two notes that sound together either have a sweet or sour sound when struck, as shown below. 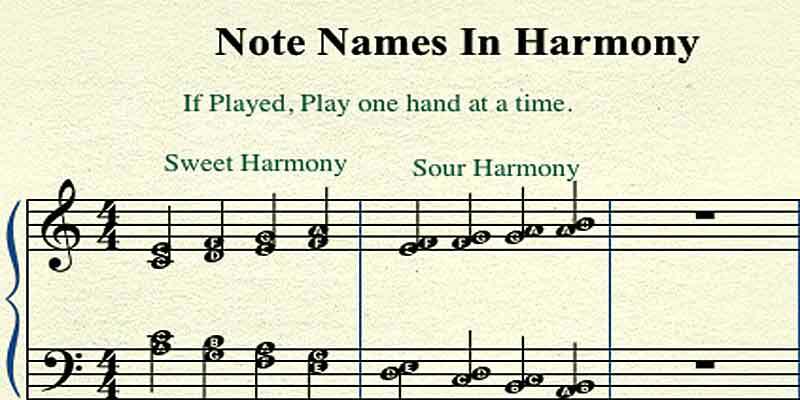 There are also sets of three notes stacked together that give you more harmony. This harmony two could be sweet or sour. These, we call chords. Note the picture below and play along on your instrument if you choose. There are also a few other ways in which music students can learn basic theory. Your student probably knows his or her colors, right? 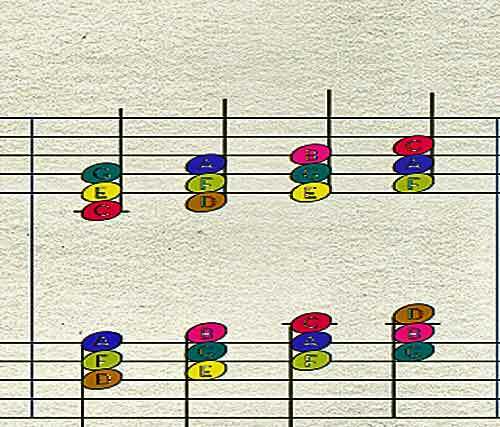 Some early notation and books use color to stand for a certain note or pitch, like this. If you or your student need help with understanding music theory basics, you could contact me or click the hyperlink above. Also, check back often as there will be updates to this page. Click to go back to the homepage.